135 Feet for us Americans. 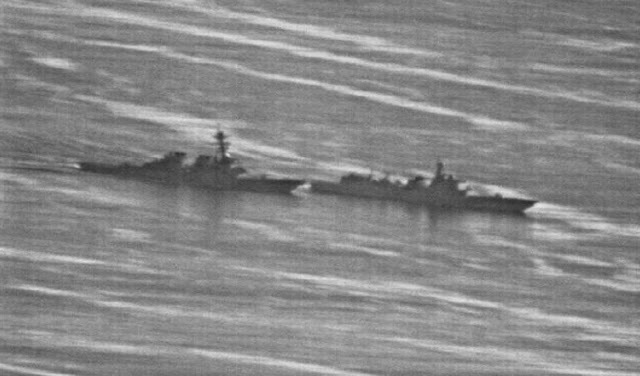 gCaptain has just obtained photos showing a confrontation involving the U.S. Navy destroyer USS Decatur and a Chinese Navy warship in the disputed South China Sea over the weekend. I've written before about how ridiculous it is to accuse Russia of breaching the peace by flying bombers near Alaska borders when the US does the exact same thing. The US has arguably demonstrated this hypocrisy recently by challenging Chinese borders with their military ships. The true enemy has never been Russia (whom we actually share genetic, economic, political, and religious similarities) the real enemy is China. China will be the next World Power after 2031 and we should be careful to position ourselves in not being the aggressor. Alaska is in a precarious place because we are in an easy place for either Chinese or Russian invasion. No mistake, once the American Empire falls China will look to Alaska as it's next colonial base. Hopefully, they don't succeed in their quest. What's not in dispute is the fact that China has become much more aggressive militarily on the global front.